This is a sermon, so feel free to mutter an occasional amen or shout a hallelujah. And like any congregation of believers, you probably already know some of the things I’m going to say. But we are here to reinvigorate our faith, so please be seated while I take the pulpit, thump the mic and clear my throat. You are living in the best time in history to be a photojournalist. So what makes now so great? To start, you have an enormous array of tool choices. For a recent New York Times shoot I eagerly packed in my bag a vintage-1948 press camera, a medium-format TLR and a DSLR. I used all three on the shoot, swapping sheet-film holders, cranking 120 through a Rolleiflex and twitching images through the pixel array of the little high-tech wonder alongside them. We are now deep enough into the digital age that the quality of that equipment has reached heights we could have only imagined a few years ago. And with the recent and expected announcements of new gear from the big digital players, we are in for astounding advancements this year. But we also have the entire world of film cameras to use, with all those delicious differences in look, point of view, depth of field and other things that make various cameras see the world differently. As Kevin Kelly, author of the book What Technology Wants, recently told NPR,“I say there is no species of technology that have ever gone globally extinct on this planet.” Today we can still use pretty much all of the photographic technology ever invented. Yes, you can buy color transparency films in 620 and 127 sizes (hand-cut and rolled by a few dedicated souls) and new single-use, screw-base flash bulbs (from Ireland), if you’re willing to pay the price. Online you can buy kits to make cyanotypes, argyrotypes and kallitypes. You can buy the chemicals to mix any developer formula concocted or to embrace the silvery glow of a daguerreotype. “Everything that we have made in the past,” said Kelly, “is still being made somewhere in the world today.” And it is available to us thanks to the reach of the very same Internet that has upended our old business models. In some areas there is even expansion. More black and white films are available now than there were in 1990. With their manufacturers out from under iron curtains or no longer forced to compete for shelf space with the big three film makers, more than a dozen brands of monochrome film are readily available. Some have been made in Eastern and Central Europe for decades. 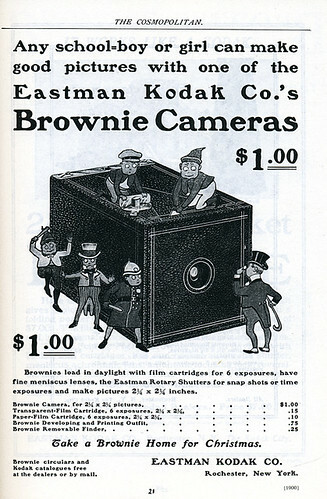 My favorite leisure camera of the moment is a folding Kodak/Nagel Vollenda 48 from the 1930s. It takes 127 film (thank you, Croatia) and gives everything at which it is aimed the feel of the decade in which the camera was made. It took the place of a digital point-and-shoot in my pocket. I love all of that variety. Sure, about all of it can be modeled with good digital technique, but art is in the process, not just the product. And the latest round of digital technology has brought us fantastic ISO capability that will probably reach a usable six digits before we can say “existing light in a coal mine.” We now have rich color even on the extremes of exposure and more dynamic range than I could have dreamed a decade ago. Remember all those color correction filters we used to have to carry around just to get accurate color? Now they’re a button and knob on the camera or two sliders in your raw conversion software. Soon enough we may see professional light-field cameras that allow focus correction in post-production. In an advancement that would make filmmaker/photographers like Robert Frank, William Klein, Raymond Depardon and Tim Hetherington jealous, we now have HD video available in our camera bodies with a sensor twice the size of high-end cinema film. The once high cost of entry into documentary film production has just dropped faster than one of Herman Cain‘s shoes. The learning curve has become impossibly short as we can experiment furiously and see the result immediately. The digital age also means unprecedented speed of delivery. In the decade some have called the heyday of photojournalism — the 1980s — to get an image from a revolution in Iran meant sweet-talking a diplomat or a traveler into carrying your film on a flight from Tehran to Paris or New York. It was days from event to publication. Now with a satellite phone and a tablet computer a photojournalist can publish from Libya a split second after the image is made. Combine the incredible power of digital photography with the variety of analog and you can do anything. But what about that business model? Indeed the methods we’ve used for a century to make a living seem to be going away. They’re not dead yet, though, and that gives us time to transition and reinvent how photojournalists live on their good work. Almost a century ago a few business-minded photographers and a few German magazine editors created the freelance model we’ve used so far. They created that out of a vacuum that we don’t face. Pieces of the solution for an economic puzzle are popping up all the time. In my 25-year career I’ve spent haystacks of money chasing personal projects that at best have returned break-even cash. We are driven to document whether we have a patron or not, and in the past that was just one of the costs of doing business. But now thanks to the Internet-made idea of crowdfunding a good project can have hundreds of patrons who may not only cover the cost of field production but also provide a little financial breathing room. Pay close attention to Emphas.is, Kisckstarter and IndieGoGo to see where that leads. Watch how photographers, agencies and collectives like LUCEO Images repurpose work for alternative venues and media, and then both make money and market themselves in the process. Frankly, you have it much easier than Jacob Riis did. Keep your eyes on other media for answers as well. For example the music industry is in the grips of an economic chaos that looks remarkably like what the news media has been facing — loss of markets, lack of control over the means of distribution, ease of amateur production and distribution, and the free and open spreading of their product. Out of that, musician and entrepreneur Trent Reznor has figured out how to make piles of money from giving away most of his music. It’s the Nine-Inch Nail meets the Long Tail. Like for Reznor, the Internet’s reach is a valuable tool for photographers to sell their work. Once forced to use agents and portfolio reps to market themselves, we now have — for better and for worse — the unfiltered channel of the Internet to find new buyers, collectors and clients. It is a crowded market out there to be sure. Everyone wields a camera, thinks they are brilliant and shares their images for free with everyone. But competition forces us to think harder, work harder and be better image makers to rise above all that noise. And this is not a new phenomenon. So here’s the most important fact to remember: Rather than killing the professional photographer, early 20th-century advancements allowed professionals to reinvent the art itself. In 1914 Oskar Barnack put some cine film in a new little camera he crafted in his workshop and the age of 35mm photography was born. Innovators like Kertész, Cartier-Bresson, Capa and Eisenstaedt were more than great photographers. They were revolutionaries who picked up surprising new “amateur” equipment, filled it with fast new films and revolutionized the way we see the world. This is that moment all over again, where new and innovative technology in brilliant hands will change the paradigm. Like me you’ve daydreamed about shooting alongside the likes of those guys in the last paragraph and helping to redefine what photojournalism would be for a century. But this is your time, and you have the opportunity to upend everything just like they did. Seize it. Foment revolution. Change the history of our art and our profession. This post is a reworking of a presentation I gave at the 2011 edition of APAD’s Geekfest in Denver, and an article published in the excellent January/February issue of Photo Technique magazine.